(As always, click on photos for larger versions.) 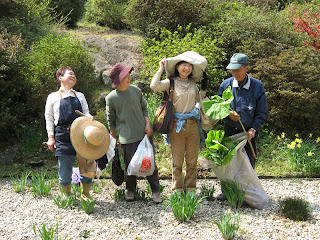 On a recent spectacular April morning, my friend Hiroko and her parents came to pick me up for a day of “picking up wild vegetables.” Off we headed to Mt. Eboshi. We drove up and up and UP the mountain. Hiroko leaned oer and solicitously told me to roll down my window, because "the air is much healthier up here." I was only too glad to do so, because her father's driving, coupled with the lack of guard rails (aaaaaah!) was making me very carsick! We stopped at an uncle's house (he wasn't home) to use the toilet and pet the uncle's dog. Then Hiroko's taciturn father took me behind the house to a surprisingly dark stand of cedar trees. There were two low bars, with branches (thin logs?) about three feet long propped on either side of the bar, to make sort of an inverted V shape. We leaned close to see the various mushrooms he grows and harvests. There weren't many, but the few that were there were interesting. They said when it rains, the mushrooms spring up overnight. I wish I'd gotten a photo here. Then we stopped on the side of the road so Hiroko’s father could show me fresh bamboo shoots, the right size for harvesting -- they are mostly underground, which I didn't realize. There were several big holes where wild boars had rooted up some shoots to eat, scattering bits and pieces everywhere. We continued up and up and up. I was shocked to see houses here and there, with electricity and Internet and utilities. We arrived at the aunt's friend's house (the aunt is Hiroko's mother's younger sister...there are five in the family, with Hiroko's mom in the very middle, with an older brother and sister and a younger brother and sister). The friend was just darling, and the aunt was great, too. She put on a heavy velour/velvet bonnet (Little House on the Prairie style, but in velour!) with flowers all over it, parked a wide-brimmed straw hat on top, and off we went to the steep slope behind the house. There was a second, smaller house behind the first house (great landscaping, lots of rocks and TONS of flowers everywhere!) The second, smaller house had a very tall fence around it, with barbed wire at the top. I looked, and realized there were five cat faces at the window. Turns out the woman built the house, complete with beds and those tables with the quilts and heating elements underneath, for her seventeen CATS! The smell...oh my, the smell...was just horrific. I can't imagine how bad it would be when it gets hot! I wore my sneakers, but I should have worn hiking boots. Next time, I’ll know. We went out back, climbing up a slope, then down. We were walking on matted down briars and brambles and dead ferns, with wild boar holes everywhere. The footing was not good at all. Hiroko was of course being very solicitous of me, pointing out ferns for me to pick. I finally got exasperated with her and told her to go pick her own! Her parents and aunt ranged all over the slope, like little old mountain goats, climbing over rocks and brambles. We were picking the long stems and uncurling fronds of a kind of fern. They weren't what I’d always thought of as fiddlehead ferns...they were long stems like asparagus, with a white bloom/dust on them that wiped off when we touched them. 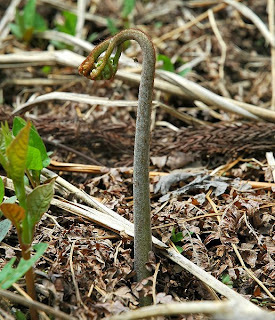 At the end of each asparagus-like stem were one, two or three little tiny tightly curled fists of fern fronds. When Hiroko looked up the name in her electronic dictionary, it just said they were “bracken” – in Japanese, warabi (蕨 / わらび). To prepare, they are soaked in water with baking soda, then boiled and served with soy sauce. 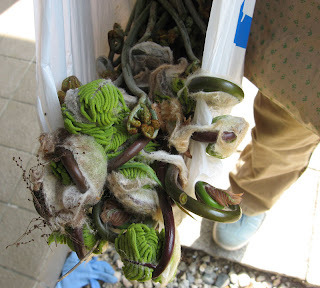 Hiroko's mom also picked some BIG fern buds (I know they are not buds, but that's what they seem like) which were more like what I think of as fiddleheads, but these were very big, bigger than golf balls, but not quite as big as a tennis ball. The bud things were very heavy for their size, and bright green under a thick, woolly/cottony coating. There was such a lot of cottony coating it looked like someone was wrapping them to pack them up! I took photos, of course, but not while we were picking. I was trying not to break my neck! In Japanese, these are called kogomi (こごみ)… I think. I’m not sure. We also harvested a bunch of things that looked like great big lotus leaves or lily pads, with long thick red and green stems. They looked like pale rhubarb, but were not. They’re called “butterbur” – in Japanese, fuki (菜蕗/ふき) – and they are a member of the daisy family. 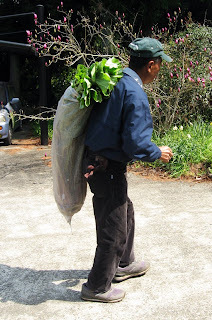 Hiroko’s family strips off and discards the fat leaves, abrades and scrubs the stems with salt, peels them like one peels celery of its strings, then boils them – a technique known as itazuri, or “removing harshness.” When I looked up butterbur online, I found that it has medicinal properties. Butterbur is supposedly very effective against migraines and asthma, and was used by Native Americans as a remedy for headache and inflammation. It’s also known as “sweet coltsfoot” and “bog rhubarb”, so maybe my rhubarb comparison was not so far off? After picking for an hour or two, we all sat down on the matted brambles, just *plop* right there, and had plastic bottles of cold, nutty-tasting tea, our sweat drying in the cool mountain breeze. After our tea break, we made our way back to the house with our loot. My bag was the lightest, since my bad knees simply didn’t allow me to go bounding all over the hillside. We took our leave, walking up the very steep driveway with many exhortations from the aunt's friend to come visit again. 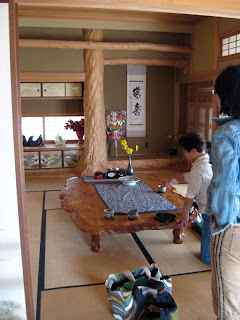 Then we went to the aunt's house, which Hiroko and family had never visited. The aunt married a carpenter, and they had four boys. They were very poor at first, and she worked her fingers to the bone, doing mother/wife things all day, then doing carpentry work beside her husband at night (unheard of, both for a woman to do carpentry, and for them to do it at night!) But they made money and slowly built a good business. A few years ago, they finally gave up their teeny house and decided to build from scratch. So, we got to see the gorgeous home they built together. It was amazing...huge lava rocks (from when Mt. 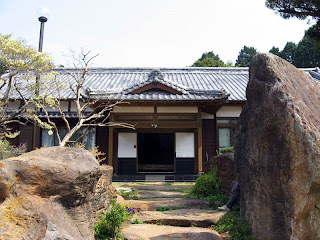 Eboshi was a volcano) created rough, “natural-looking” terraces, with flowers everywhere...huge doors were thrown wide to the mountain breezes...shining slabs of satiny wood were everywhere. The construction was fascinating. 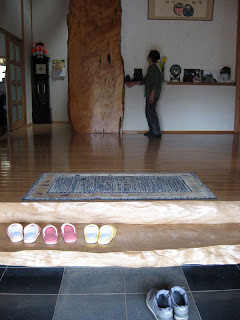 The steps where one takes off one's shoes are made of two huge thick slabs of a single tree. Another giant slab of a tree is in the entry way. The beams are incredible. 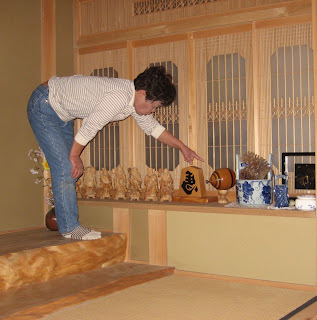 We had green tea in a beautiful, serene tatami room, where the aunt showed off the seven lucky gods her husband carved for her, as well as their family altar, obviously much used. 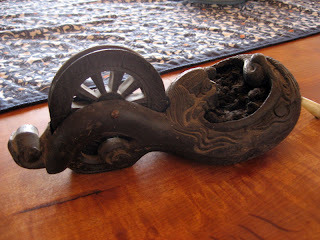 There was a big wooden...thing....on a shelf, with a wheel with a groove in it, and thread or string wrapped around the wheel. I asked what it was, trying to figure out if it was a spinning wheel or what? It was a very large rounded boat or shoe shape. 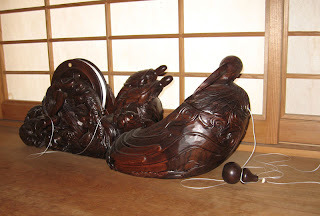 There were turtles carved standing on part of it, and the fattest part had a crane with wings outstretched. Finally I figured it out. It was a chalk line! There was an ivory (or bone or plastic) knob with a sharp metal point at the end of the string. One puts the point into the wood, then walks along, paying out the string. The string passes through the fat part of the boat/shoe, which has fabric stuffed in it, impregnated with a black ink stuff that is water soluble. One moistens the wadded fabric just slightly, and the string picks up the ink stuff. Then one spins the wheel to return the string inside the thing. I was obviously fascinated, especially once I knew what it was. 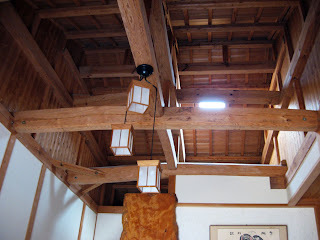 Hiroko’s aunt laughed and explained that the big one was decorative, because it was so large. I was disappointed, until she ran out and came back with a smaller version, obviously well-used, and proceeded to demonstrate. She then gave me two of them, a larger and a smaller! They're both used, and of course everyone was saying "oh, you don't want these, you want to buy new ones!" but I said "oh no, I love these...and my father and stepfather will appreciate the fact that they are well used and well loved!!" She told me I should come back in August to escape the heat in the city. I told her I wanted to move in today -- but first I had to ask, "Do you have Internet?" She said yes, and then had to show me that she had better than Internet...she had a karaoke machine, with a ton of laser disks! Of course, she does not speak English, but Hiroko interpreted, and it's amazing how much one can understand simply with body language and charades. I told her I was definitely moving in, and she laughed and said that was fine, if I would teach her grandchildren English! We sat around the table, and drank green tea, and peeled and ate oranges I'd never seen before...they are yellow, not orange, and milder than regular oranges, not quite as sweet, and nowhere near as acid, and very fragrant. I thought they were squat lemons when I first saw them. 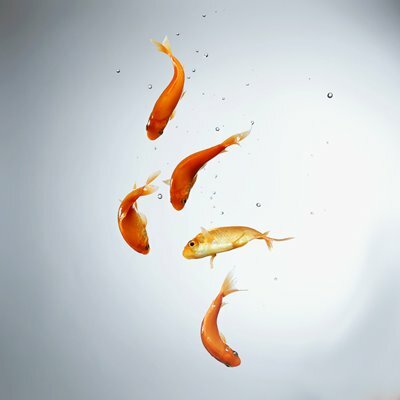 They’re called haruka, which means “far away” in Japanese. Hiroko didn’t know why they were named “far away” – I wish I knew! Before we headed back to Sasebo for a late lunch, Hiroko and her parents drove me to the very top of Mt. Eboshi, to the lookout. Unfortunately, it was a very hazy day, so the view wasn't great. But there were several hawks, and some signs showing various flowers and various birds to look out for, including one tiny, fluffy little bird the color of the inside of a kiwi fruit. There was a giant field, with lava rocks just sort of tossed out all over it. I wondered if it was supposed to be a Zen garden, but it was all short grass and not sand, and far more expansive than the Zen gardens I've seen. Then I thought maybe it was supposed to represent the constellations, because there was a big plaque showing the constellations of the summer sky. Hiroko said it was just a park. Who knows? One thing that shocked me -- there was a city bus, just sitting by the side of the road, with the driver reading a book! Hiroko said the city bus comes all the way up to the top of the mountain, up those insane, steep, curvy roads, three or four times a day! So there are lots of people who live way up on the mountain, in relative isolation, but they have utilities and bus service to Sasebo (which is at the foot of the mountain) so nobody is isolated, even without a car. I received quite an honor -- I was invited to come up the mountain at Obon for the ceremony for Hiroko's uncle, who passed away earlier this year. The first Obon festival after a person dies is the most important. Lamps are hung and lit, and food is put out for three days. The lamps light the ancestor's way home for a visit. Then at the end, the ships are built for anyone who has died during the year, to help the deceased find their way to the spirit world (and keep him or her from haunting the family!) A big ceremony is held, then the ship is taken to the center of town, with fireworks along the way to scare away bad spirits, and much shaking and rocking of the ship to shake off bad spirits...I participated in a small way with Eriko's ship (she works for the base and I wrote about last year's Obon with her and other folks from the base). But this will be much bigger, more solemn, and more…authentic, somehow. I’m really honored to be invited. After we got back to Sasebo, we headed to a local hotel with an organic, mostly vegetarian Japanese buffet (Hiroko and her family are macrobiotic vegan). I enjoyed several different spring dishes, especially burdock root (gobo in Japanese) in various preparations. Gobo are long, thin carrot-like taproots, with lots of tiny rootlets sticking out. They have brown skin, and cream-colored insides, are much thinner than carrots, and MUCH longer. I also found out that konnyaku, that greyish gelatin-like stuff that is used in many dishes here (I don't like the chunks, but I love the noodles they make from it!) is made from devil's tongue starch. Although I knew that, I had no idea that devil's tongue was the same thing as Jack-in-the-Pulpit! Konnyaku has very little flavor, and can be made in a lot of shapes...and has zero calories and a lot of fiber. A couple of days after our wild edibles adventure, Hiroko brought me various dishes her mother had made with the butterbur, the young bamboo shoots, and the bracken stems (no big fat fiddleheads, though). All three were savory, slightly sweet, and utterly delicious – the more so, I think, because I got to participate in the “harvesting” of the tender stalks! How are you today? I'm superfantastic!